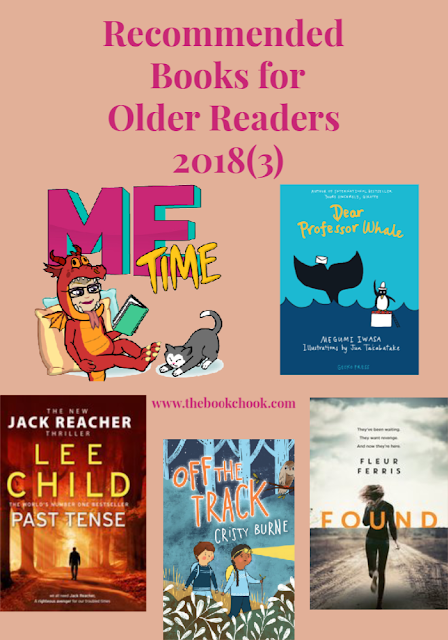 Here is my latest instalment of books for older readers - that is, not picture books. You might also be interested in my recommendations for older readers earlier this year. Off the Track is a junior novel by Cristy Burne, published by Fremantle Press (2018) RRP: $Au 14.99 PB. This is a chapter book with occasional black and white illustrations that’s just perfect for newly independent readers who need something they can sink their teeth into. The characters are real, and the plot is dramatic but believable. Harry and Deepika start out the way you would expect for two kids whose only connection is that their mums are friends. But gradually the bush works its magic and the two find out more about themselves and each other. The Australian bush itself is another character in the book, and I know youngsters will feel connected to the adventures and problems the children have there. This is one to recommend to readers 7+ who look for action, drama, and realism in the books they read. Check out a sample chapter at Fremantle Press’s website. Teacher notes are also available. Dear Professor Whale is a children’s novel by Megumi Iwasa, illustrated by Jun Takabatake and published by Gecko Press (2018.) RRP: $NZ 17.38 PB. Professor Whale is the only whale left at Whale Point. He thinks often of the old days when his friends were all around and they competed at the Whale Point Olympics. One day, he gets a letter from Wally. The young whale has heard about the great big enormous whale who won gold for his spectacular spouting. That gets the Professor thinking. What if there could be a new Olympics, with the sea full of whales again? In this charming follow-up to the international bestseller (Your Sincerely Giraffe), another correspondence flourishes across the horizons. The letters bring penguins, whales and seals together at the Whale Point Olympics, with friendship and humour winners on the day. Dear Professor Whale is such an unusual book. It’s difficult to classify quickly, but that is not something negative. It’s a gentle story and I believe it will potentially appeal to children between 5 and 10. It’s not an easy reader - there are longer, more interesting words, although the concepts are not too difficult for kids 5 and 6. The illustrations are quirky, and definitely add to the book’s charm. Kids 8 - 10 who might not look for an illustrated book will perhaps be attracted to the idea of a story where animals are competing in their own Olympics. And children of any age who do not themselves fit into a reading stereotype might well resonate with the book’s warmth, its talking animals and okay, dare I say it, the book’s “cuteness”! For example, I loved the hand-written letters between Wally and Professor Whale. There is a reference in an introductory page to the fact that the book, Yours Sincerely Giraffe, came before Dear Professor Whale, but children would not need to read the earlier book first to appreciate this one. Found is a YA book written by Fleur Ferris, and published by Penguin Random House Australia (2018.) RRP: $Au 19.99 PB. But when her dad disappears before her and Jonah’s eyes, Beth discovers that he's not who she thought he was. Her family’s secret past has caught up with them, and someone wants her dead. Even though I’m not the targeted audience, I enjoyed this action-packed, suspenseful read. There were sections of Found that genuinely left me breathless because, without realising, I’d held my breath. The characters are realistic, likeable and nuanced. The story premise pulls you into the book immediately, and the dialogue is believable. Believable dialogue does mean some swearing - and that’s what makes the young people sound exactly like the ones you overhear talking to each other in real life. Ferris obviously has an excellent grasp of how teens feel and think and act. I am a survival junkie so I loved the bunker, the drone, the critical thinking, and yes, the relationships, the twists and turns, and the characters - even the villains. I would suggest Found to teens who enjoy adventure, drama and action. I hope they’ll find it as difficult to put down as I did. Past Tense is a novel for adults written by Lee Child and published by Penguin (2018.) It’s available in lots of different formats and can be pre-ordered here. RRP for the Trade Paperback is $Au32.99. At the very same moment, close by, a car breaks down. Two young Canadians are trying to get to New York City to sell a treasure. They're stranded at a lonely motel in the middle of nowhere. It’s a strange place… but it’s all there is. I have read all the Jack Reacher books. I would say Lee Child is one of the few authors who has never let me down. He promises action, suspense, and adventure and delivers in spades every single time. Jack Reacher as a character is very likeable, at times admirable, always three -dimensional. If you look for stereotypes you will find them here but they never bother me. I often forget to breathe when reading Lee Child book, and although it temporarily deprives my brain of oxygen, it is definitely a reader’s mark of respect. Past Tense is a great read. It reminded me again how Child’s writing style suits me as a reader. Child isn’t one for too much description - his prose is lean, his writing is tight and active. He doesn’t let literary showing off get in the way of his story. Like so many other Reacher tales, Past Tense has a wonderful gallery of quirky characters. Child chooses a few salient points and wham! that person is sitting next to you while you read. This is the twenty-third in the Reacher series, and I am already hoping for Number 24! Read an excerpt on Penguin’s website. Find novels and books I enjoyed last year in Recommended Books for Older Readers 2017 (1) and Recommended Books for Older Readers 2017 (2). Look out for my Recommended Book Gifts on December 5, 2018, where you will also find several books that will most definitely appeal to adults and older kids.